OK, so, here we go...let's discuss sauerkraut... I know, I know....some of you may not be fans of sauerkraut, because it's too this or it's too that....yeah yeah yeah, I've heard it all before. But seriously, give this one a try! Have I ever lied to you? For starters, rinsing the sauerkraut makes it less harsh. So right off the bat, it's not, like, crazy sour. Not only that, I always add apples to sauerkraut because, frankly, that's what my Mom always did. It makes it a little sweeter and besides, pork and apples are a classic pair. 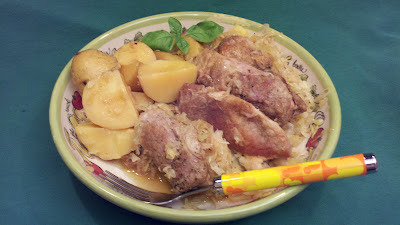 And when everything gets together...the pork, the apples, the onions, and the kraut, it all comes together PERFECTLY and it tastes anything but sour. It's just slightly tart and big time flavorful! So there. That's my sauerkraut argument. And can we just talk about the pork??? OMG it just falls apart! I absolutely LOVE how tender it comes out. If you don't own a heavy cast iron Dutch oven, I SERIOUSLY recommend getting one. I use mine ALL the time and it's quite literally my favorite piece of cookware. Just sayin! So give this recipe a try. It's REALLY easy and just as yummy! Promise!! Season the pork generously with salt and pepper. Place in the pot and sear on all sides. Transfer to a platter. Add the onions and apples. Saute until softened, scraping up any browned bits from the pork. Add potatoes. Add the meat back to the pot, along with any juices. Place sauerkraut on top. Poor chicken broth over all. Cover and place in oven for 2 hours or until the meat is very tender. If you use another kind of potatoes, it might be a good idea to go ahead and peel them before you quarter them. The skins of the new potatoes are very tender, so there's no need to peel, but other types of potatoes have thicker skins and may not be as tender. You can also cook this dish at a low simmer on the stove top for the same amount of time. You could do this in a crock pot as well. Whenever you cook sauerkraut...add some chopped celery leaves to the pot. It'll help to make the sauerkraut as pleasing to your nose as it is to your taste buds. Really!